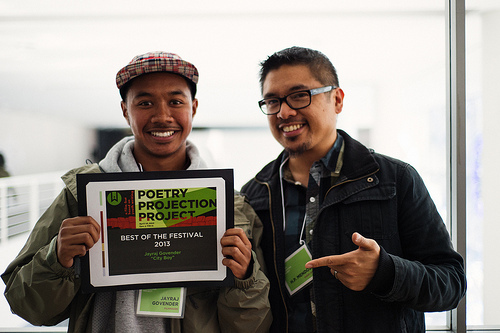 WritersCorps, an organization that teaches creative writing to underserved youth, held the third annual Poetry Projection Project, a festival of short films inspired by youth poems, at Yerba Buena Center for the Arts in San Francisco. Special guest juror H.P. Mendoza, an award-winning San Francisco-based filmmaker (”Colma: The Musical,” and “I Am a Ghost”), announced the winners of the festival. One of the finalists shown at the festival was created by students from WITS Houston in a collaborative project with Aurora Picture Show. Middle school immigrant students at Kaleidoscope Middle School wrote and filmed a video that explores the places they left behind, the places they now call home, and the places they imagine. To see the winning videos from the Video Projection Project sponsored by WritersCorps, click here. Congrats to our Houston students!